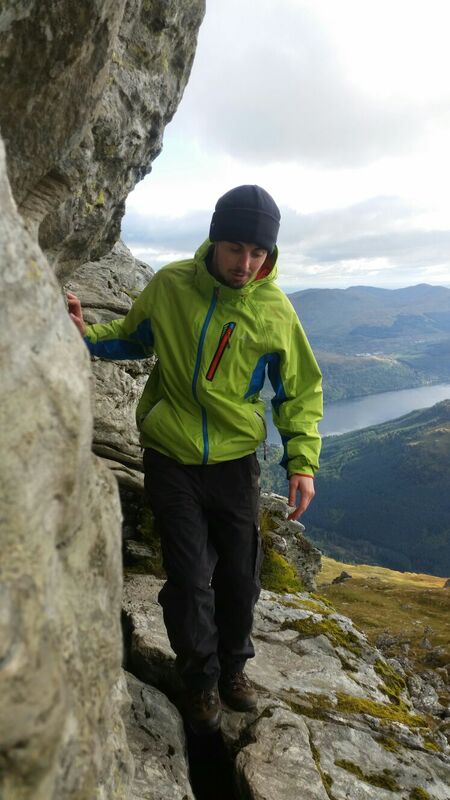 The Arrochar Alps is a brilliant name, whoever came up with it knew exactly what they were doing. They were awarding these mountains an accolade – one that meant the respect of walkers and climbers across the country. They were also giving the mountains a reputation that would live on for years after the name was conjured up. I’ve read stories about the guys who first explored this area with the intent on climbing, and I’ve listened to other stories around bothy fires of how the place was, and still is strewn with boulders, caves and other howffs. To be able to visit these places so easily and imagine what it was like for these guys is a near blessing. 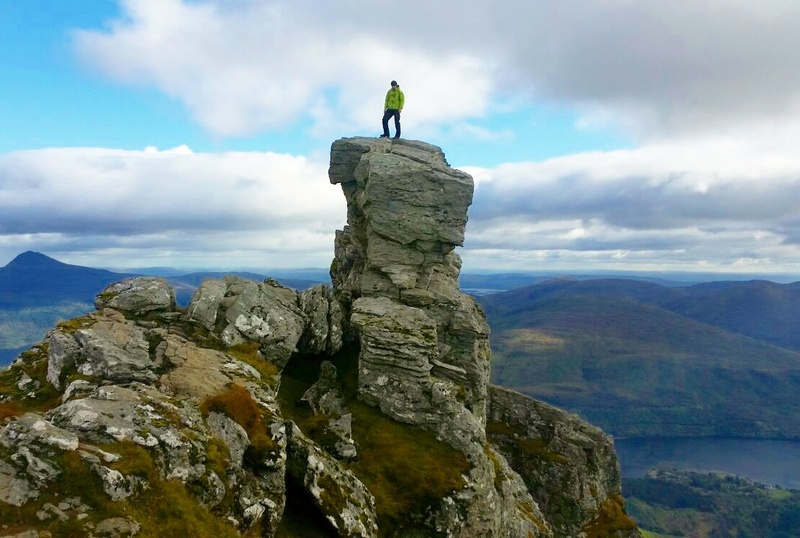 I often wonder if the hordes of people flocking to go up The Cobbler on a Saturday afternoon are aware that they’re stepping into legendary Scottish climbing territory, and that they’re following in the footsteps of some of the most influential and important climbers of the 20th century. We left the car park about 9am, and started through the woodland to walk straight up the burn that runs down the front of Cruach nam Miseag towards Loch Long. This is the more direct route up Beinn Narnain and the only way I’ve climbed it. I can imagine it being a bit rubbish after heavy rainfall since most of the first 300 metres of ascent is literally walking up the middle of the burn! We didn’t mind much today though as there was a period of high pressure and the weather had been good the last week or so. 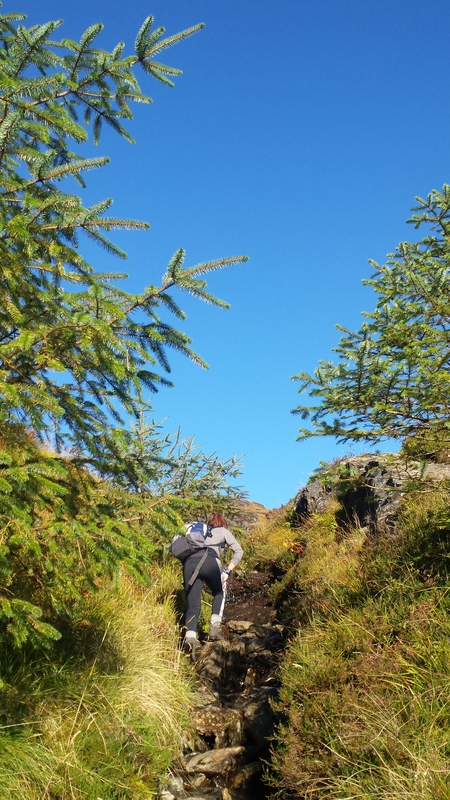 With this being the first hill Kayley had been up in a while, we took it easy and stopped now and again to relax and enjoy the views back down to Arrochar and over to Ben Lomond, and then further up the views along Loch Long. The skies were clear making perfect conditions for photos, plus we were in no rush at all and playing everything by ear. Beinn Narnain was the only plan we had set. 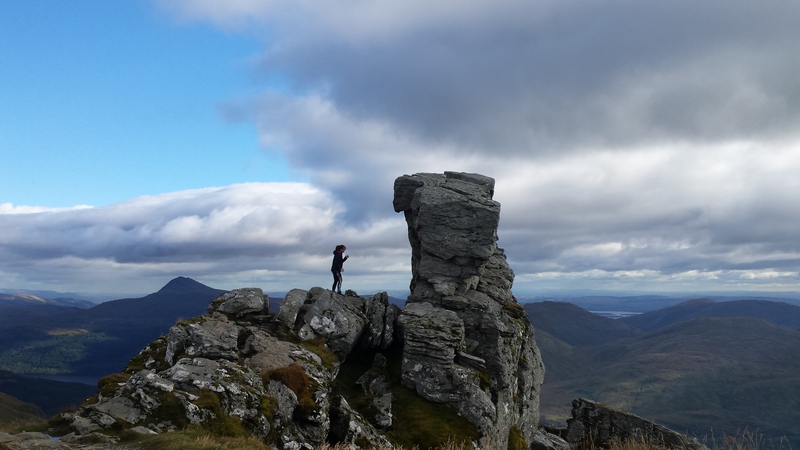 Looking over towards the point of Ben Lomond. As we kept on up the steep front of the mountain, I warned Kayley of the multiple false tops of Beinn Narnain. I talked about the first time I climbed the hill – how I was on my own, and for about 20 minutes I was certain the summit of Cruach nam Miseag, which was just in front of me, was the top of Beinn Narnain when in actual fact Beinn Narnain is behind it and more than 300 metres higher, and about another 45 minutes walking at least! Even with the reminder, I still got asked the question that I’ve asked myself plenty times over the years… ‘Is that the top up there?’. After the steep front of Cruach nam Miseag was behind us, the hill started getting a bit more interesting. The ratio of rock to grass changed in favour of rock and some light scrambling ensued. This is the good bit of Beinn Narnain, the bit that gives the hill its character. Although there’s nothing technically difficult about it, there are plenty options to make it as interesting as you’d like. We stuck to the more direct route and it wasn’t long before we were at the foot of The Spearhead. I stopped Kayley for a breather and gave her an extremely brief history lesson about the rock face infront of us. 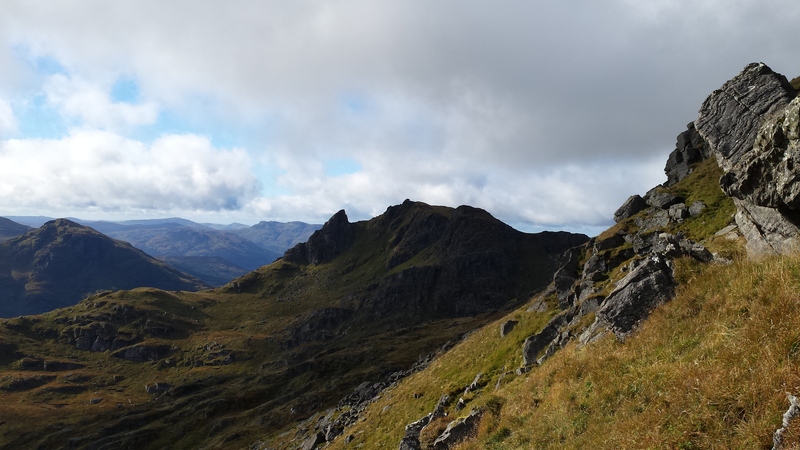 The Cobbler from the slopes of Beinn Narnain. Minutes before I turned into the Professor of Scottish Climbing History, I had told her that we were literally five minutes from the summit and that had obviously given her a boost of motivation and energy. In that instance she didn’t care that groups of lads from Glasgow used to down tools on a Saturday lunchtime, hitch hike up to Arrochar, walk up to this point for sunset and bivvy in any of the nooks and crannies that are scattered throughout the area, with the sole purpose of climbing this not-so-huge rock face in front of us (and other routes in the area) on the Sunday to then get back home that evening to start work again on Monday morning – a concept that I find outrageously impressive. Not impressive enough to stop Kayley marching up and over the boulders to the right of The Spearhead and on to the summit. The girl was on a mission. Kayley standing at the top of The Spearhead. 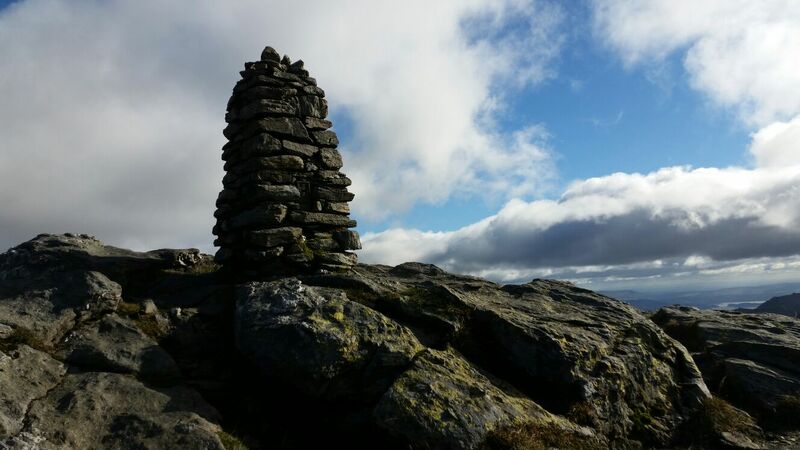 Before we arrived at the trig point, we wandered over to the wee cairn that sits at the top of The Spearhead – the rock face we were standing at the foot of five minutes earlier. The views from here are brilliant with a great line of sight over to Ben Lomond and the Ptarmigan Ridge, round to Loch Long, and then over to The Cobbler, and further over towards Beinn Ime. A couple photos later and we were sitting in the shelter cairn just beside the trig point eating our sandwiches. The wind had started to pick up and it was bloody freezing and the rain was starting to spit, not enough to get us wet but enough to keep us from warming up. So after about 20 minutes we headed off again down the other side of the hill with the decision to walk back along the glen and maybe nip up The Cobbler if our legs were feeling up to it. By this point the wind was picking up more and it was getting really cold with the rain coming and going in brief showers so we were getting a move on coming down the path. It was at this point I started hearing what I thought was a baby crying… which was weird considering I was probably at least 2500ft above sea level and halfway up a mountain. It went away though and I never thought anything of it. Two minutes later I heard it again though… more crying. This time it was clearer and seemed closer, so I turned around to look from under my hood up the hill. Couldn’t see anything. Weird. Another two minutes later and I definitely heard it again. It was definitely a baby crying so I stopped and pulled my hood down and looked back up the hill, only to see two people coming down the hill fairly quickly behind us. Within about 30 seconds they had caught up with us and I noticed it was a couple – the woman about 20 paces behind the man, but the man was wearing a rucksack/baby-carrier with a baby in it. A baby?! As the guy walked past he had a huge smile on his face, ‘Sorry to ruin the ambience of the hills guys! Haha!’. Now don’t get me wrong, it’s not my place to judge anyone’s parental abilities but I honestly couldn’t believe it, this father had brought his baby, that looked about 3 or 4 months old up a mountain in weather that was forcing adults to layer up and put their hoods up. A baby that would probably feel the cold in its own cot at this time of year, never mind the cold of the fickle Scottish weather. 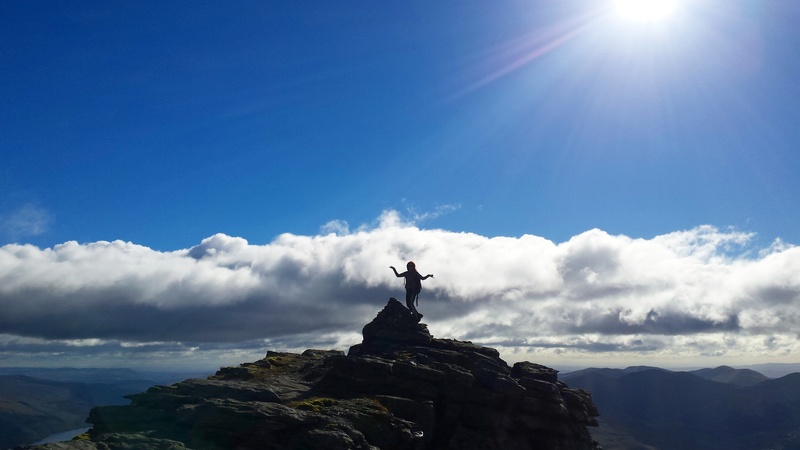 Apparently it was the baby’s second Munro of the year… as if that made it better. As if I should congratulate him on the success of carrying his child up a Munro. The couple marched on ahead of us with their infant bawling and wailing all the way down. Not a very reassuring sight. By the time we reached the bottom of Beinn Narnain, it was about 14:30 so we agreed to carry on up The Cobbler. It was a steep ascent but made a lot easier by the built path all the way up, the first 100 metres being steps! As we neared the top, we started passing other walkers on their way down – probably about 15 in total, then when we arrived at the summit there were another 6 people, and in the time that we were at the summit, another 7 people arrived. It was only a Monday! I hadn’t been in this area on a weekend but I can imagine I would definitely find it too busy. Kayley eyeing up ‘the needle’. I had seen plenty photos of the true summit of The Cobbler, the mass of rock that requires some mild but exposed scrambling. When I finally set my own eyes on it though, I’ll admit that it seemed a bit higher and more exposed than I imagined. There was a group of four guys that were taking turns to ‘thread the needle’ and get on to the top of the rock. They had been waiting on another couple doing the same. A queue to get to the top of a mountain? Where the hell was I? Hellvelyn in the height of the summer holidays? Pfft, I wasn’t digging this. But we waited anyway, and I spoke to the lads that had just came down from the summit. Once they had climbed up and got their pictures taken, it was my turn to have a look. I got up fairly easily although there was a bit of over stretching involved, and the rock was so polished parts of it had completely changed colour! Anyway I got my picture taken posing with the obligatory man-leg and clambered back down. Coming back down with the exposure visible to my left. Just as we were leaving the top, a young lad on a mountain bike and what seemed like his entourage of 3 adults and another youngster were arriving. He was dressed in what looked like a competition outfit with sponsors plastered all over his top and trousers. The young teenager done a few wheelies as the entourage took photos and told him how amazing he was. All a bit weird. Anyway we headed off down as we were starting to get hungry and cold. 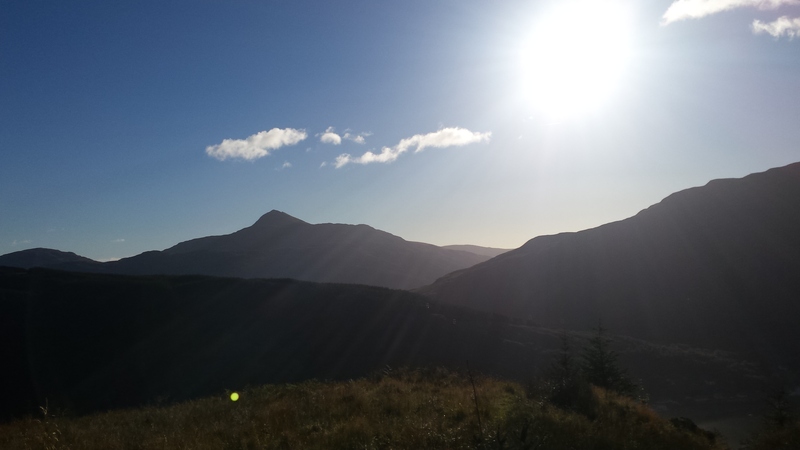 By the time we had reached the bottom of the path to then start along the glen back towards Arrochar, I noticed that the sun was dipping low in the sky. It wasn’t even 16:00 yet, the nights were definitely drawing in. We were maybe about half a mile along the path that makes its way in and around the huge boulders and rocks that are scattered through the glen, when I heard the clanking of metal behind us. It was the young lad on his mountain bike with his fan club marching behind him. I got Kayley’s attention and we stepped off the path to let him whizz past, he gave us a thanking nod. Less than a minute later he turned around and started cycling back up towards us, so again we let him past. Maybe two minutes later, I heard the same clanking of his bike so turned around and here he was again speeding down the path showing no signs of slowing down, so again we stopped walking and stepped off the path to let him past. No thank you this time, not even an acknowledgement. This happened again five minutes later. I was getting a bit pissed off at the lad’s lack of consideration for other path users but he was still young, and I could see him speeding on ahead so didn’t give it much more thought until another couple of minutes later I seen him stop and turn around again! As we watched him cycle past us again up towards his entourage, I looked back along the path towards the man (by the sounds of it, he was the lad’s uncle) who was with him. The guy showed no sign of concern that the mountain bike was disturbing us, as well as the other couple walking back to Arrochar about 50 metres in front, and forcing us off the path every time it sped by us. I almost started feeling sorry for the young boy because he was clearly a talented mountain biker, but hadn’t been taught the importance of being a responsible countryside user. 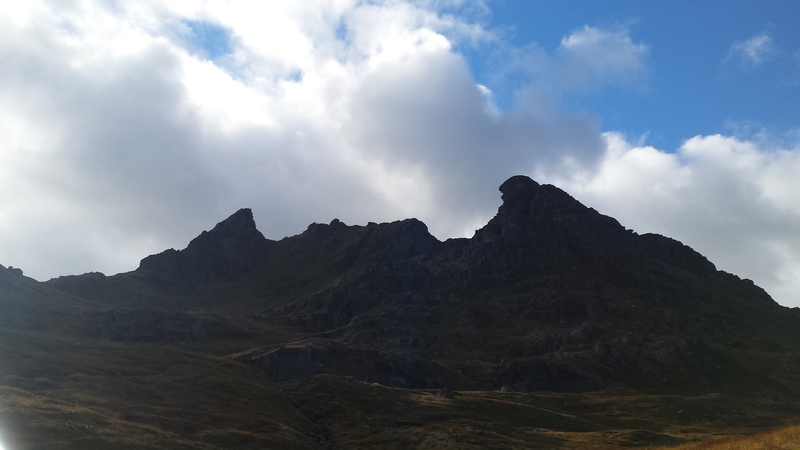 The Cobbler from the floor of the glen. Anyway, me and Kayley kept on walking, talking about what we were going to get for dinner when we got back. It was between a supper from the chip shop in Arrochar or stopping in for a carvery in Dumbarton. As we were talking about this, I turned around to look back up at The Cobbler and instinctively grabbed Kayley off the path. Seconds later the lad on his mountain bike came speeding past us again! The boy hadn’t slowed down or even shouted out ahead to let us know he was there, probably assuming that we could hear him and would jump out his way without asking, again. Galloping behind him was his uncle, I tried to grab his attention to let him know that this wasn’t on but he was too busy giddily running along with the young lad trying to take photos of him like a One Direction fan chasing Harry Styles along the street. After a few choice words of frustration and anger, I decided to just let the whole group pass by us. It wasn’t worth getting annoyed at, we had had a great day on the hill and that was fine. It was just frustrating seeing people who obviously thought of themselves as ‘outdoorsy types’ clearly showing that they were infact the exact opposite. Irresponsible countryside use comes in all forms and this was just as bad as any of them. But back to the main point – spending the day with my girlfriend enjoying two brilliant hills in a great part of the country that is steeped in Scottish climbing history. What a way to spend a day off, and a sausage supper was the icing on the cake.